Welcome! In today’s blog, we are going to be discussing an important piece of business bookkeeping — accounts payable and the importance of an effective accounts payable system. First think about your business — does your company have a successful business bookkeeping system set in place for accounts payable? Or do you frequently miss your payments? A strong accounts payable system is critical for the success of your business and can have a huge impact on you bottom line. So, exactly how can accounts payable make or break your bottom line? Suppliers are key to the success of your business, so it’s important to build and maintain strong relationships with them. One of the best ways to achieve this is through accounts payable. Just like you appreciate being paid on time and in full, so do your vendors. It’s crucial for your business to have a successful accounts payable system in place to ensure your suppliers are being paid accurately and on time. When you secure a good relationship with your suppliers, they will often offer company perks, such as, better terms and deals, delivery times, and more. On the other hand, if you frequently pay your bill late and avoid communicating with your supplier, they will definitely not go above and beyond to help your business and can cut you off from inventory completely. On top of that, your reputation as a business can be severely damaged, making it difficult to find other suppliers who will work with you. Create positive relationships with your suppliers by always paying your bills accurately and on time. If you know you are not going to be able to make a payment on time, let them know as soon as possible and keep the lines of communication open. Ultimately, the survival and success of a company relies on cash flow, so it’s important you monitor your cash flow regularly through proficient business bookkeeping and understand how business operations directly affect your financial assets. Do you know how accounts payable affects your cash flow? Ultimately, you need to make sure you budget and keep track of your outstanding bills and lines of credit correctly to ensure you have the cash flow to pay your bills on time. If you are not managing your cash flow efficiently and precisely, you will end up with negative cash flow, which can ultimately lead your business into a downward spiral. Monitor your cash flow regularly and pay attention to patterns, so you can budget efficiently and plan ahead for low cash flow. This will help you stay in positive cash flow and help your business succeed during difficult times. As you can see, the two essential parts of accounts payable that affect your bottom line are your relationships with your suppliers and your management of cash flow. Having proficient accounts payable and cash flow systems in place are a huge part to creating great relationships with your suppliers, which can lead to profitability. Once you build those relationships, you can often reap financial gains through better terms and rates, new products, delivery times, and more. Do you need help managing your accounts payable? 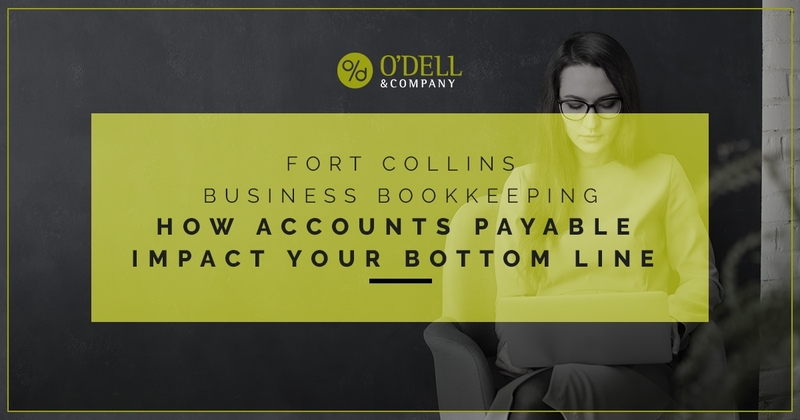 Learn more about our reputable Fort Collins business bookkeeping services or contact us via phone or email today. We look forward to helping you maximize your business’s bottom line.